Save online using code SPRINGFUN2019 Cute Cottage~Pet Friendly!!! Located in beautiful Gulf just steps from the sandy white beaches and the Hangout! If you desire a peaceful getaway, you have found the right place. Our Beach Cottage is newly renovated, fabulously decorated and very charming. From the hardwood floors to the open kitchen and living area, you will feel right at home. We take pride in our Beach Cottage. We love to getaway, go fishing, eat out, play golf, go swimming, lay out, and walk on the beach. We are sure you will too. Enjoy your vacation, family trip, weekend getaway, extended stay, or even our winter here at Gulf Shores, of the cleanest white beaches. The living room has plenty of comfortable seating for everyone, and a new flat-screen HDTV. In addition, there is a queen sleeper sofa. There are three bedrooms; two upstairs... the first with a queen bed, the second with a pair of twins and a queen downstairs. Each bedroom has a wall mounted flat screen TV in case you would like to retire to your own space. Our fully-equipped, eat-in kitchen has a table for 4 and the bar will seat 6. In the beautifully decorated bathroom upstairs, you will find a stack washer & dryer for your convenience. A second bathroom is located downstairs. Enjoy the tropical breeze as you relax on the very spacious screened porch. Gulf Shores is a very family-friendly town. There are two local restaurants that have large outdoor sand play areas for children along with live music and more. Lulu's is on the Intracoastal Waterway, just 2 miles north of the beach. The Hangout is at the main public beach. There are two historic forts (Fort Morgan and Fort Gaines). We also have go-carts, putt-putt and a water park if you get tired of sand and sun. We hope you'll give us a try. 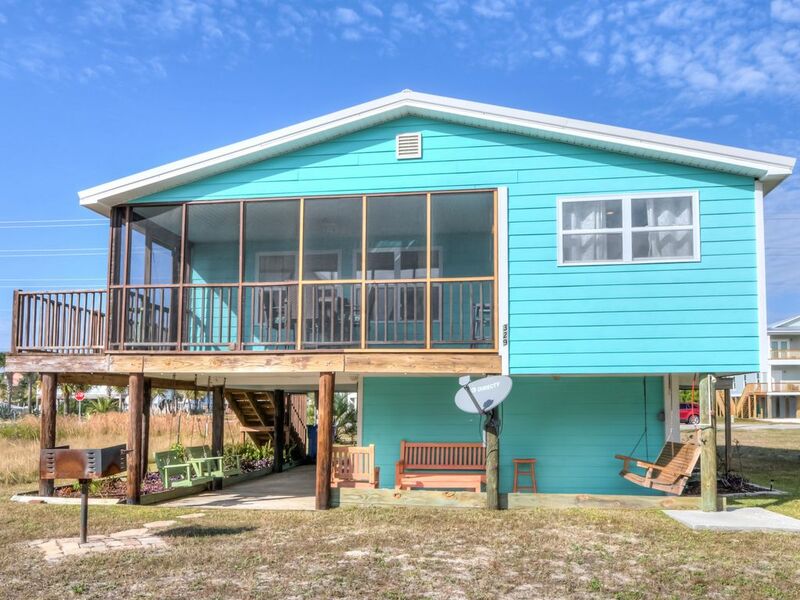 It is an affordable and comfortable place to relax with your family or friends in Gulf Shores. West Beach Cottage is centrally located between Mobile and Pensacola. Biloxi, MS Casinos are only two hours away! I bought my beach property from my aunt a year ago. It was built in 1958 and had been neglected for a very long time. I gutted my little house and completely remodeled. I guess you could really say, I rebuilt this little beach house. This was a new and exciting venture for me! I installed new central heat and air, including the duct work. I rewired, added new ceilings, walls, cabinets, counter-top, kitchen and bathroom floors. The bathroom fixtures are all new. I also added a new metal roof, doors and windows. The furniture and appliances are all new and hardwood floors have been refinished. I actually did not know there were hardwood floors until I started remodeling!! It's very important to me to have a nice, comfortable vacation rental for families to enjoy and feel 'at home.' I live in Birmingham, AL and have enjoyed vacationing in Gulf Shores all of my life. I hope you enjoy your stay and will love Gulf Shores as much as I do! My beach house belonged to my aunt for many years. She is no longer able to travel and decided to sell. Across street from beach; within walking distance of Hang-Out; restaurants and attractions minutes away!!! In the beautifully decorated bathroom upstairs, you will find a washer & dryer for your convenience. A 2nd bathroom is located downstairs. We really enjoyed our stay. The house is very quaint. The beach was easily accessible. The only reason I didn't give 5 stars in all categories is because of the condensation always on the air vents. I'm very glad that we noticed the little note on the counter about this problem. We never had the air below 70 and most of the time it was set at 72. We had to constantly wipe the vents because I certainly did not want to be responsible for damage from something out of our control. The only time we had doors open was coming and going other than when we first got there. Other than that, we had a great week. Thanks. This was like a home away from home. It was so nice to have all the amenities of home. This cottage is beautifully decorated and located on a quiet street. With 2 small children, we very much enjoyed the screened in porch and the yard area as well! The patio downstairs with the swings were a hit at nighttime to relax and play. We loaded up the wagon and made the surprisingly short walk to the white sandy beaches with no problem at all! So so so many wonderful places are within walking distance, and perfect with one in a stroller. All on foot, we souvenir shopped, we bought grocery items, we went to the Hangout to eat and play and listen to live bands, we ate at Bill's (delicious anytime, but especially brunch), played at Bill's, and also got take-out from several nearby restaurants! Everything was well taken care of and CLEAN. Also important to note was the air conditioner worked wonderfully. We look forward to a return trip to our new favorite spot on the Gulf Coast. What a great weekend! The house was perfect for my group and just steps from the beach! There are delicious restaurants in walking distance as well as stores for all of your needs. The house itself has upgraded appliances, great bathrooms and plenty of space for everyone. We loved hanging out on the downstairs patio and enjoying the beach breeze! I highly recommend this house to any family or group looking for a fantastic getaway weekend! Beautiful, warm and cozy Beach Cottage. Loved it! Across the beach. And all your favorite restaurants and stores in walking distance. Can not wait to go back !!!! Loved this place from the minute we walked in it! Looks just like the pictures, beautiful inside. Perfect for my family of 4 and a friend. Loved being able to walk right across to the beach, to the Hangout, to many restaurants, ice cream shops and stores. Didn't have to worry about driving and parking all the time. The owner was very helpful and wanted to make it enjoyable for your vacation. We would definitely go back and stay again. Just so relaxing, cozy and comfortable for this family!! Thank you, Laura, I am so happy that you and your family enjoyed your stay in my little cottage. Y'all are welcome to be my guests anytime! This house is perfect. It only takes a 5 minute walk to go from the living room to the beach, and about 8 minutes to walk to the hangout! The yard was well manicured, the house very clean, tidy and cozy. This was the first beach trip my fiancé and I have taken together, and now we plan on staying 5 days a year. Given the location, it's perfect for ANY age. There are plenty of shops, restaurants, and family fun parks all within about a 2 mile radius. I would recommend this house to anyone looking to relax and have a great vacation. Michael, so glad you and Kari had such great time!....I appreciate your timing the distance from the house to the beach. I have actually never thought to do that. It's good to know that my little cottage is actually just "minutes away" from the white, sandy beaches! I hope y'all can come back. You are such a lovely couple! Walk right across the street to the Hangout! Beach access is just steps away. MINIMUM AGE LIMIT FOR RENTALS IS 25! Rates listed above do not include: Departure Fee $220 Non-refundable Pet Fee $100 + tax (limit 2 pets per reservation) Processing Fee $65 Lodging Tax 13% Damage Waiver $69 Please use the BOOK NOW button to reserve your reservation today!